The Tory MP Daniel Hannan is a profoundly dishonest Brextremist. In this article I'm going to analyse just one of his Tweets to demonstrate what a spectacularly untrustworthy propagandist he is. On February 8th 2018 Hannan Tweeted this graph from the Bank of England to illustrate his claim that real wages are rising. He also included a claim that the pound has recovered back to where it was before the EU referendum. As you can see from the picture, over three hundred impressionable people liked this Tweet, and it was Retweted over 170 times, but it hardly takes any work to establish that both of the claims he makes in the Tweet are outright lies. You don't even have to resort to Google to see that the first claim about real wages being on the rise is a lie, you just have to look at the graph he's Tweeted. What the graph shows is that wages (the blue line) are currently rising at a slower rate than inflation (the red line). This means that in real terms wages are falling because they're rising at a slower rate than the cost of living. Hannan is such a crap liar that he has Tweeted out a picture proving that he's lying. 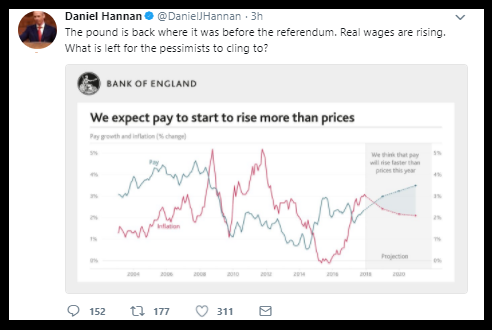 What the graph actually shows is the Bank of England are projecting that wages will overtake inflation at some point in mid to late 2018, which would have been OK if Hannan had explained it that way, but he didn't, he lied that wages are already rising faster than inflation. 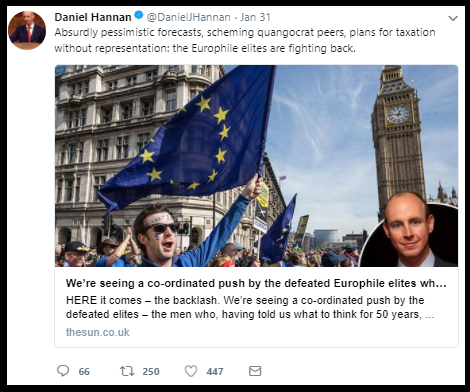 Even if Hannan had explained that he's happy to put his faith in the economic projections that real wages are set to rise (rather than just lying), here he is just the week before dismissing negative Brexit economic forecasts as the work of "scheming quangocrats". So if Hannan doesn't like the economic projections he describes them as a conspiracy by corrupt "quangocrats", but if he likes the economic projections he misleadingly presents than as being true now, rather than being mere economic projections. You couldn't really ask for a clearer example of the toxic brew of confirmation bias and outright dishonesty that pervades the Tory party. This period doesn't look much if you don't follow economics closely, but the part I've marked on the graph actually represents the longest sustained decline in workers' wages since records began! This spectacular and unprecedented collapse in the value of workers' wages happened as a result of the Tory party imposing ruinous austerity dogma and extreme wage repression policies on the post-crisis economy. If I was a member of a political party who had overseen such a catastrophic collapse in workers' wages, I certainly wouldn't be drawing attention to it by Tweeting it out in a graph! Now we can turn our attention to Hannan's claim that the value of the pound has risen back to pre-referendum levels. It doesn't take much effort to Google the exchange rate between the pound and the euro, and lo and behold it's roughly 1.14€ to the pound. 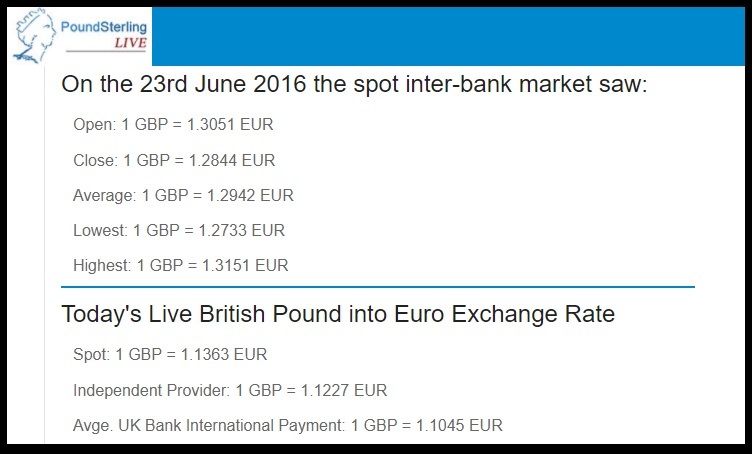 So in Daniel Hannan's world, a range between 1.122€ and 1.136€ is higher than a range between 1.284€ and 1.305€. Either that he's just absolutely crap at lying. Daniel Hannan is a liar. He's such a liar that he lied twice in the same damned Tweet. And he's such a crap liar that he included the evidence that he was telling lies in the same damned Tweet as he told the lies in! 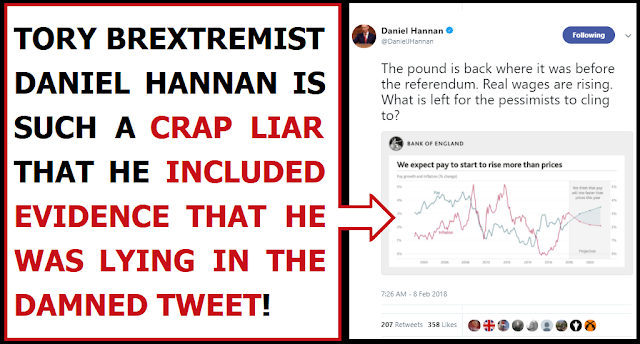 Liars like Hannan are dangerous. 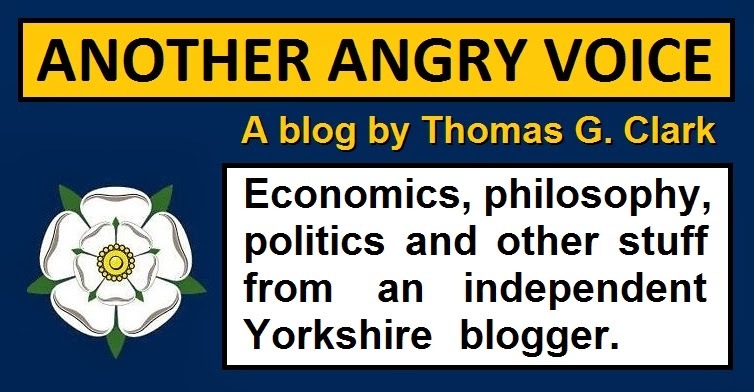 Liars like Hannan prey on the gullible. He know perfectly well that his target audience has no interest in understanding the graph that he attached to the Tweet, he just put it there to add a veneer of legitimacy to his lies. Beware of liars like Daniel Hannan.